Hoping to enter it in some car shows soon. Maybe some who are interested in doing a conversion of their own sometime can drive it. Currently working on forced air induction right now, and hopefully a gtr bodykit so I can run wider tires to harness this things capability. Plumbing for ram induction coming along. Only thing left to do is build the box and gasket and attach the scoop. Well, after all that work I ditched the gts style headlights and went back to the original pop-ups. I dont know why I just like them better. Here are some photos of my engine accessory setup. 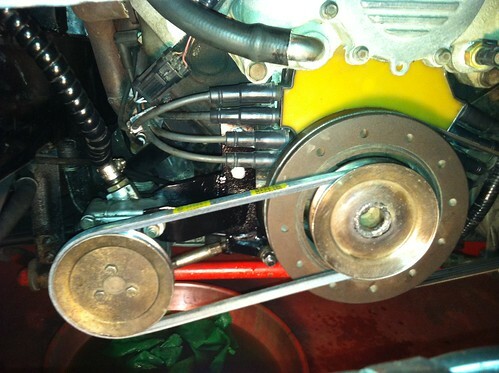 I wanted to keep the original porsche alternator as well as the original power steering pump, and not only keep them but keep close to the original positions and keep the turnbuckle belt tensioners as well. 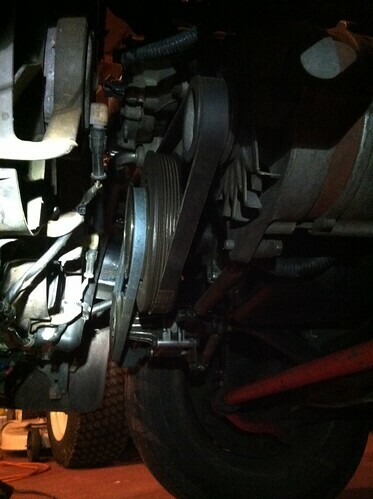 The new crankshaft pulley for the powersteering I made from scratch. The base of the pulley goes inside the recess of the GM harmonic balancer and is held in place with the original GM crank bolt. 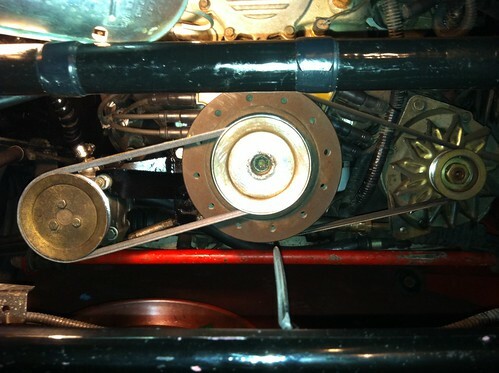 The v of the crank pulley is designed to run a 1/2" belt, which rides a little high on the power steering pump pulley, but functions quite well. 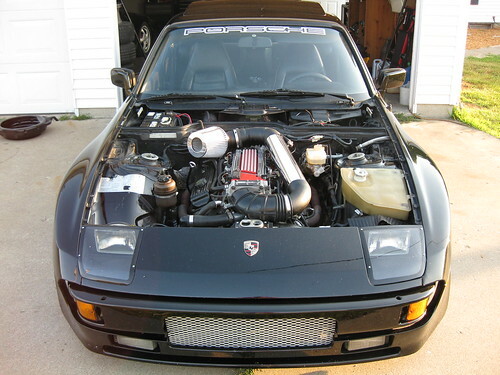 Keeping with the 924s accessory system makes engine less intrusive to the engine bay. I wanted the monster torque of the v8 but didnt want to end up with a chopped up hot rod. Outside of the increase in power I wanted the cars personality to stay much the same. And it has for the most part. The power steering pulley on the pump crowded the fan bracket on the radiator, so I decided to move the radiator forward. 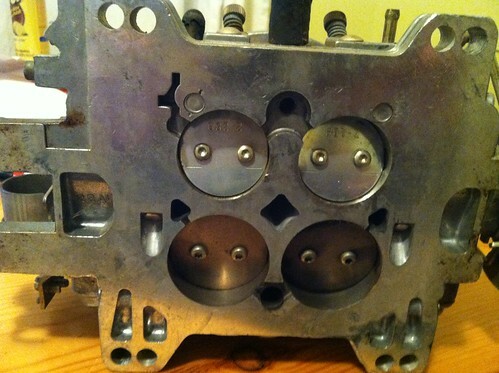 This also has the benifit of giving me better access to the LT1 water pump, as it too was very close to the 924s fans. 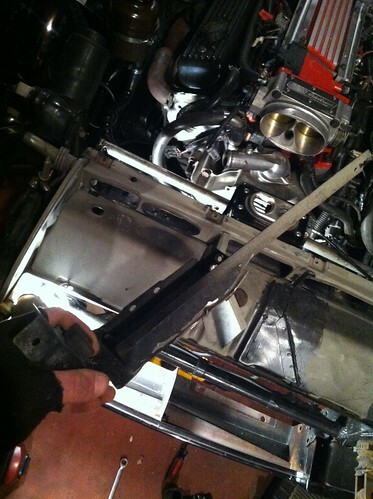 After carefully drilling the spot welds and some cutting, here is the 944 type radiator bracket removed from the unibody frame rail. 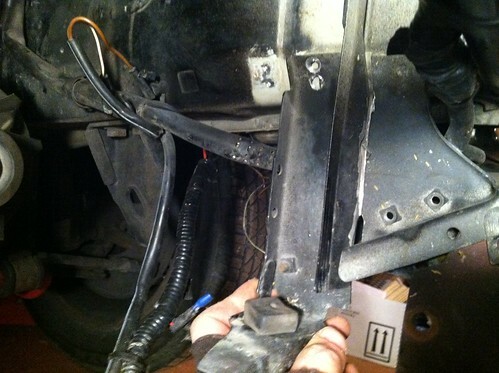 This picture shows how far forward I moved the radiator brackets. Not much, but everything fits like a glove now. 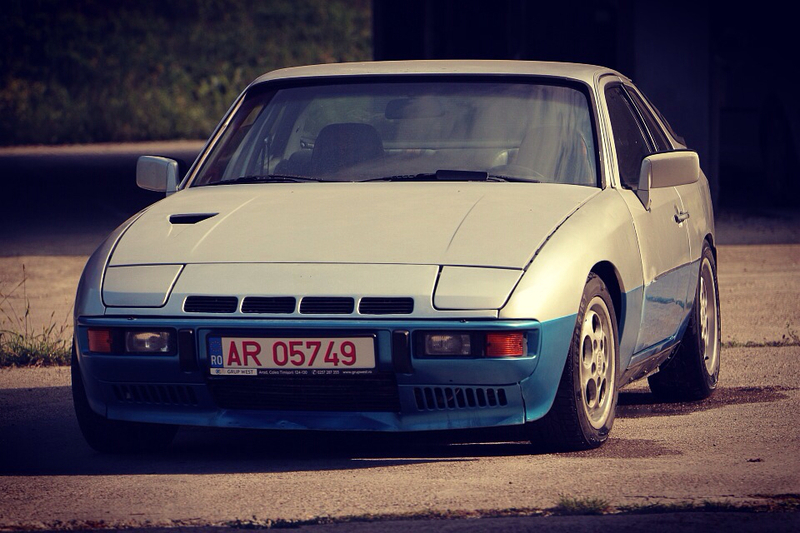 but I never ran the circuit because the porsche cooling system always kept the lt1 at the proper temp at hot idle. My experiences may differ from others on this, but I can only report things as they happen on this car. 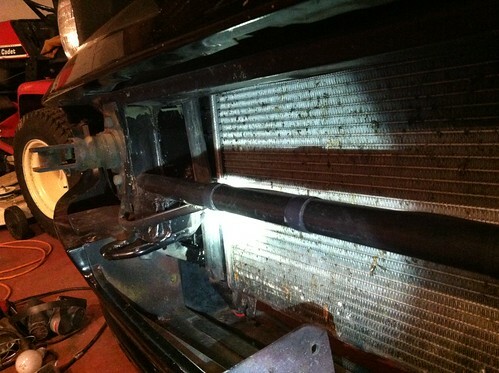 Radiator in new forward position with room to spare on both sides. whip it good.. that things insane. Sorry what? 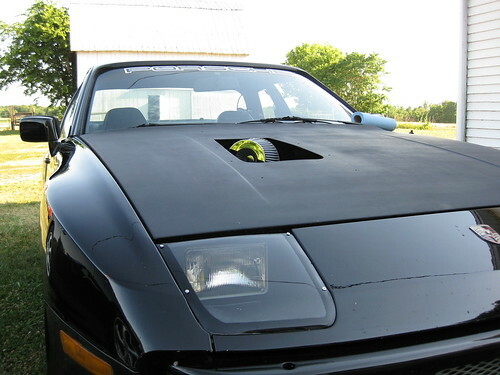 I couldn't hear you over my pop-up headlights. I acquired this. 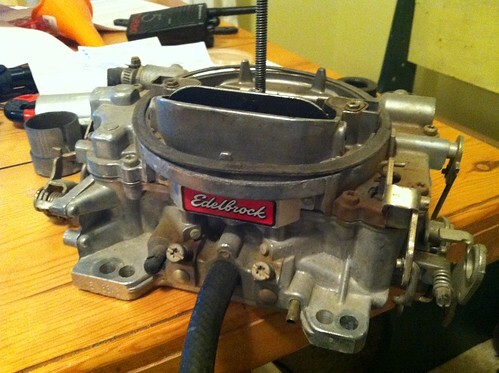 I love carbureted engines, and the temptation is vary strong to use it. It is approaching the two year anniversary since I started this project. It hardly seems possible. So far no problems of any kind. The stock 924s cooling system has been adequate in the summer, and no front engine service or leaky oil seals to deal with! The driveline has stood up and handling seems on par with my other cars. No regrets. I have acquired a large garrett turbo and toy with the idea of installing it, but so far better sense has kept the devil inside of me at bay. 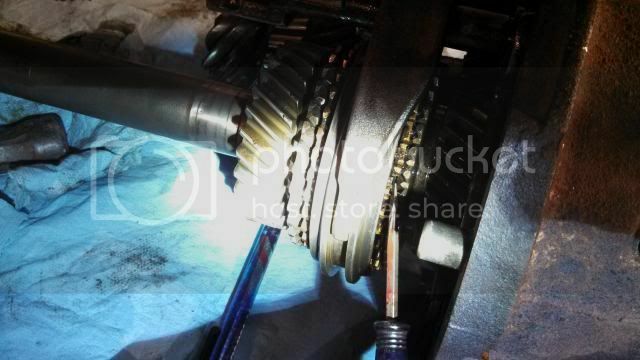 Finally got time to work on the LSD transmission. 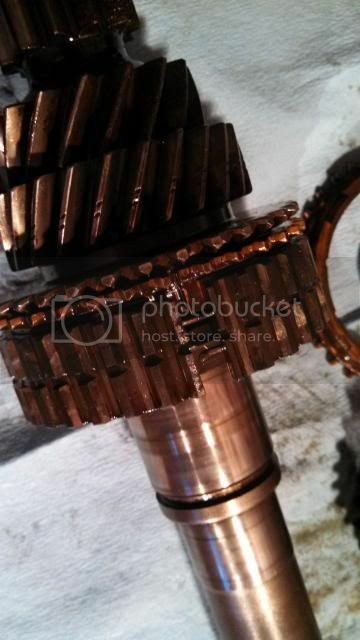 I tore it down and got third gear synchro out (the ring was broken). I had pics but the "smart" phone took a dump on me. Looking for the best deal on synchro rings. So far Pelican has the best deal at 27.50, if anyone knows a better place for transmission parts speak up! So far no problems of any kind. The stock 924s cooling system has been adequate in the summer, and no front engine service or leaky oil seals to deal with! The driveline has stood up and handling seems on par with my other cars. No regrets. 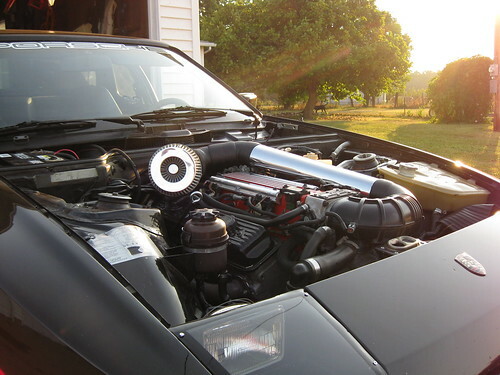 I have acquired a large garrett turbo and toy with the idea of installing it, but so far better sense has kept the devil inside of me at bay. Screwdriver is pointing to the break on the synchro ring on 3-4 cluster. 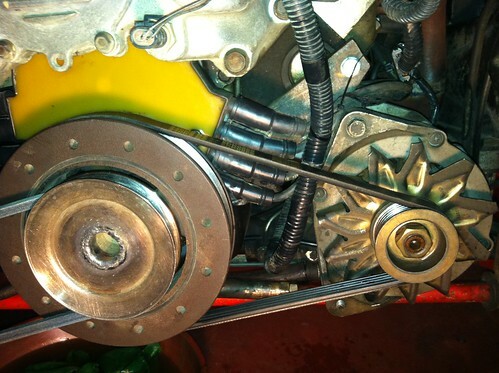 A better view of the broken ring with the input shaft out and shift collar removed.